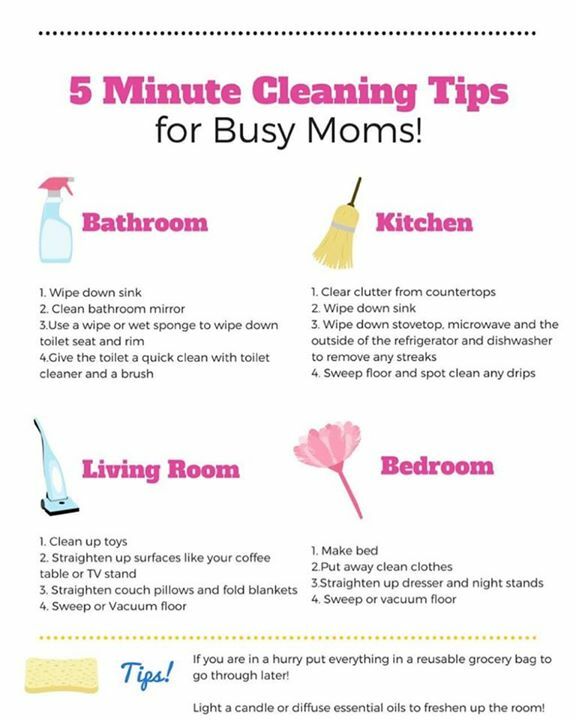 5 MINUTE CLEANING TIPS FOR BUSY MOMS! BATHROOM 1. WIPE DOWN - ProudMummy.com the Web's Community for Mums. 5 MINUTE CLEANING TIPS FOR BUSY MOMS! BATHROOM 1. WIPE DOWN SINK 2. CLEAN BATHROOM MIRROR 3. USE A WIPE OR WET SPONGE TO WIPE DOWN TOILET SEAT AND RIM 4. GIVE THE TOILET A QUICK CLEAN WITH TOILET CLEANER AND A BRUSH KITCHEN 1. CLEAR CLUTTER FROM COUNTERTOPS 2. WIPE DOWN SINK 3. WIPE DOWN STOVETOP, MICROWAVE AND THE OUTSIDE OF THE REFRIGERATOR AND DISHWASHER TO REMOVE ANT STREAKS 4. SWEEP FLOOR AND SPOT CLEAN ANY DRIPS LIVING ROOM 1. CLEAN UP TOYS 2. STRAIGHTEN UP SURFACES LIKE YOUR COFFEE TABLE OR TV STAND 3. STRAIGHTEN COUCH PILLOWS AND FOLD BLANKETS 4. SWEEP OR VACUUM FLOOR BEDROOM 1. MAKE BED 2. PUT AWAY CLEAN CLOTHES 3. STRAIGHTEN UP DRESSER AND NIGHT STANDS 4. SWEEP OR VACUUM FLOOR TIPS! IF YOU ARE IN A HURRY PUT EVERYTHING IN A REUSABLE GROCERY BAG TO GO THROUGH LATER! LIGHT A CANDLE OR DIFFUSE ESSENTIAL OILS TO FRESHEN UP THE ROOM!